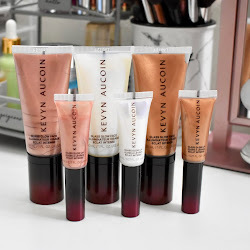 I have recently been on the lookout for new product launches, specifically in the drugstores, and have found so many new goodies to review. Let me start off with the new Total Temptation Eyeshadow & Highlight Palette from Maybelline. It comes with 8 eyeshadows and 2 highlighters to put together some easy looks. Is it worth it? Find out more and see swatches of this palette below! On the back of the palette, it says it is made to be split in half in the middle giving you two looks to create. One with the 4 left warmer eyeshadows and warm golden highlight and then another look with the 4 right eyeshadows and the pink shimmer highlight. You can definitely use what you choose and not as the guide says. The palette itself is gorgeous with the ripple or waves effect and the packaging is nice and sturdy. 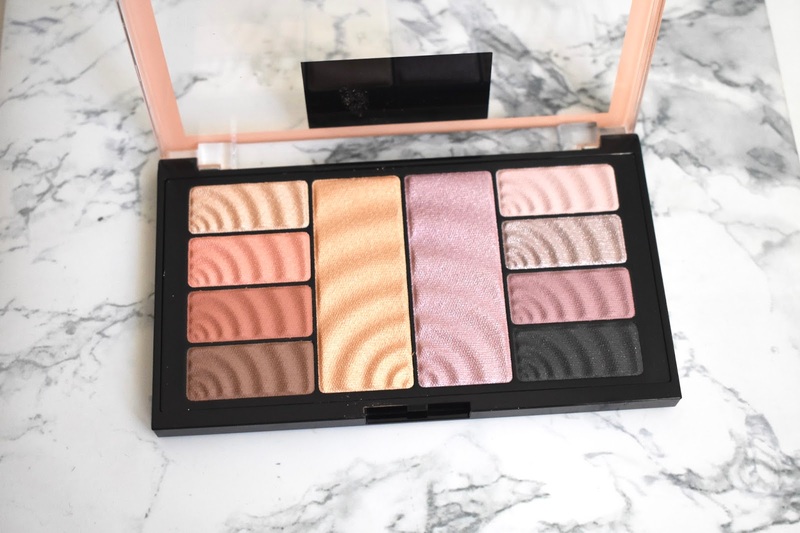 Maybelline has said that this palette has their creamiest pigmented eyeshadows and illuminating highlighters. 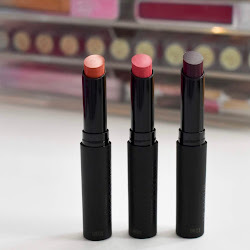 To me, the shadows were definitely better than previous Maybelline shadows that I've used, but not very creamy as they claim. They were buildable and I expected from the color range that the shadows weren't going to be super pigmented or anything. I like the way the applied on the lids (with an eyeshadow primer) and I can definitely make a few looks with this palette. The eyeshadows were easy to apply and I didn't seem to have too much fallout. The shimmer eyeshadow on the right side of the palette was the one I had to be careful about since it seemed to go everywhere. The 2 highlighters were lovely shades and I would probably be use these on the cheeks and as eyeshadows. The black eyeshadow you get is not the most deepest black at all, but it can be worked into an eye look or used on the last line to darken. So is this worth it? It depends on what you are looking for. 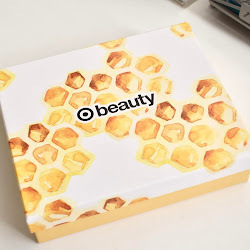 I think this palette could be great for those that want to add some color and shimmer to their looks knowing that they are going to get subtle glowy results. 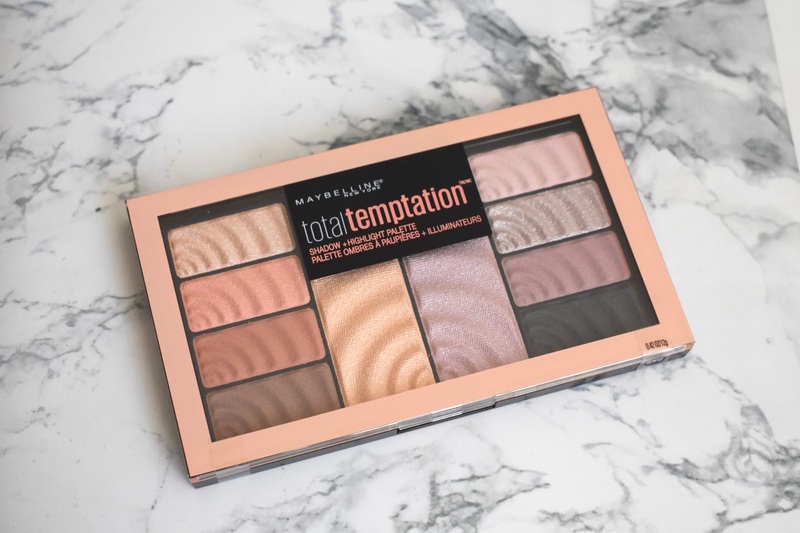 Maybelline Total Temptation Eyeshadow & Highlight Palette retails for $11.99 and can be found at CVS, Walgreens, and other retail stores. This was bought by me. All opinions are honest and my own.